AES New York 2015 » Press Release: Students: the 139th International Audio Engineering Society Convention Is Your Career Gateway! The 139th AES International Convention will have a strong focus on the future as it welcomes the next generation of audio professionals to participate in a full program schedule organized for students. 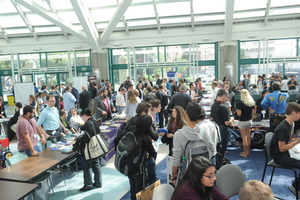 Workshops, tutorials, recording and design competitions, exhibitions and mentoring sessions will all be available to budding audio industry professionals who make the trip to this year’s 139th AES Convention, October 29 – November 1, 2015, at the Jacob Javits Center in New York City — learn what they can’t teach you in the classroom by opting for a heavily-discounted student All Access registration. State-of-the-art technologies demand state-of-the-art knowledge. While students can register for an Exhibits-Plus badge, and attend the Exhibition, the Project Studio Expo, the Live Sound Expo and a number of special events, an imminently affordable All Access registration is the only option for students, particularly student AES members, to take advantage of all the convention has to offer to catch up, keep up and get ahead. Non-member students are encouraged to join their peers as members — student membership is equally affordable and is complemented by immediate Convention registration discounts. Those discounts include full four-day All Access registration, and one- and two-day all access registration options, should time at the Convention be limited. In addition to the deep schedule of research Paper and Poster presentations, workshops and tutorials, there’s even more available to students opting for All Access registration. Student specific events kick off Thursday, October 29, with the first meeting of the AES Student Delegate Assembly. This will mark the official opening of the Convention’s student program and offer an opportunity to make introductions to fellow audio students from all corners of the world. The meeting will announce the finalists in the Student Recording Competition categories and the Student Design Competition, and preview all upcoming student and education-related Convention events. On Friday, October 30, the focus will be on recording in the Student Recording Critiques and the first round of the Student Recording Competition. In the former, students will be able to bring their recordings to non-competitive listening sessions and receive feedback on their projects. Friday’s Student Recording Competition is an AES highlight, where the finalists in each category will play their projects and get feedback from a panel of industry judges. Saturday, October 31, will be jam-packed with student-centric events including the AES 139th Education and Career Fair, which will match job seekers with companies and prospective students with undergraduate and graduate academic programs. All attendees of the Convention, students and professionals alike, will be welcome to offer a resume to participating company representatives. Admission is open to all registered Convention attendees. The “SPARS Speed Counseling with Experts – Mentoring Answers for Your Career” session will give students, recent graduates and those interested in career advice the opportunity to interact with working professionals in Q&A sessions in a 20-minute speed group mentoring format. With events like this, and the myriad of opportunities for interaction with the industry’s leading designers and researchers that an All Access registration offers, students can build their in-person professional network before they start their job search. In the AES Student Design Competition, participants will be able to show off their hardware and software designs, from loudspeakers and DSP plug-ins to hardware, signal analysis tools, mobile applications and more. Rounding out Saturday’s programs will be another Student Recording Critiques session and Round 2 of the Student Recording Competition. Sunday, November 1 will feature another Student Recording Critiques session and the second SDA meeting, where among other activities, the judges’ comments and awards will be presented for the Recording Competitions and Design Competitions. For the latest information on the AES 139 Convention in New York City, and how to register for your FREE Exhibits-Plus or premium All Access badge, visit http://www.aes.org/events/139/.